Blackjack is one of the most popular casino games of all time, and thanks to the expansion of online gaming, the beloved game of 21 can now be played safely online for real money bets. Hone your basic blackjack strategy while sampling classic and rare blackjack variants, enjoying the better odds and lower house edge of online play. BGO Casino – receive 50 fair spins on your first deposit. G’day Casino – a 100% unlimited matched deposit bonus available on all first deposits, plus 50 free spins on selected pokies. Casino-Mate – get 30 free spins with no deposit required, plus up to $1400 in matched deposit bonuses. Royal Vegas Casino – claim up to $1200 in bonuses spread out over your first four real money deposits. 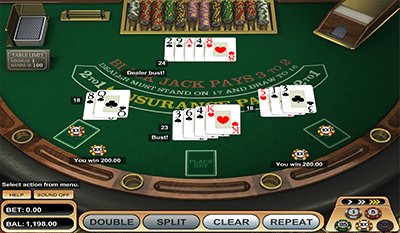 Blackjack is a sophisticated casino game requiring the perfect combination of skill and luck. While you can play blackjack purely as a game of chance, knowing a little about basic strategy will certainly enhance your chances of winning. Blackjack is an easy game to understand, so it’s suitable to both newbies and experienced gamblers. Each blackjack game variant has slightly different rules and gameplay structure, but the basis of the game is the same. The aim of blackjack is to get a hand with a value as close to 21 as possible, without going over 21, and having a hand closer to 21 than the dealer. Blackjack can be played with between one and eight decks of standard playing cards, excluding jokers, where all face cards are valued at 10 and Aces can count as either one or 11. During the initial deal, two cards are dealt and unless you receive a natural blackjack, you then have the option of hitting to receive another card, or standing to stay with the cards you’re dealt. Sign up for an account with a reputable casino like the ones recommended here at CasinoSiteBonuses.com. Make a deposit using a secure payment method like Visa, MasterCard, POLi, Neteller, Skrill, Paysafecard or direct bank transfer. Choose the blackjack variant you wish to play and load the game. Click on the chips to select your desired bet amount and click to play. Follow the prompts to either stand, hit or place any side bets which may be available. Watch the results unfold, with any winnings automatically credited to your online casino account. You can then choose to play again, or take your winnings and leave at any time. Can I use bonus cash on real money blackjack? Casino bonuses can be used to play real money blackjack, but each casino has its own wagering requirements to determine how much of your own money you need to spend before any winnings made from blackjack can be withdrawn. Check the bonus terms and conditions of the casino you’re playing at before handing over any of your hard earned money to avoid any possible disappointment. These online blackjack games can be accessed in instant-play mode directly over your Web browser, without having to download any specific blackjack software. Some Microgaming powered casinos, like Royal Vegas Casino, also provide the option of downloading exclusive casino software to your PC if you prefer to play via a casino client. Online blackjack games can be played for free in demo mode before you commit to play for real money, so you can get the hang of new rules and variants before risking any of your own cash. If you’re wanting to add a little more spice to your online blackjack experience, Royal Vegas Casino offers the option of participating in blackjack tournaments as part of the International Blackjack League. During these tournaments you play against other blackjack players from around the world in an attempt to make your way through to the final round to earn cash prizes. These tournaments can be a fantastic way to strengthen your blackjack skills, win more real money when playing online and give you some solid practice for next time you play in a land based casino. To participate, you’ll need to register for a real money account at RoyalVegasCasino.com and download the exclusive RVC casino software (new players can take advantage of up to $1200 in matched deposit bonuses). Once you’re in, head to the tournaments section, create an alias and select the blackjack tournament you wish to join from the dropdown menu. You can choose to register ahead of time, or join a Sit-N-Go game where you don’t need to register in order to play. Pay the tournament entry fee and you’ll receive notification of when your tournament will begin and how long it will last for. Each tournament has its own rules, so refer to the game at hand for the specifics. Royal Vegas also offers Elimination Blackjack Tournaments where the player with the smallest amount of chips is eliminated at certain rounds.